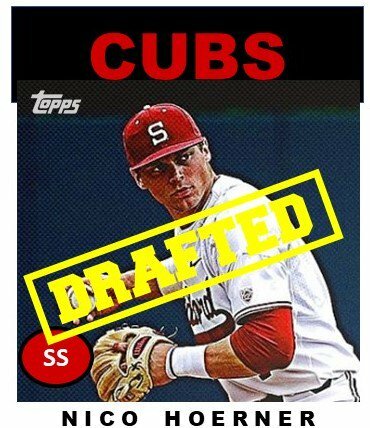 The Chicago Cubs went in an unexpected direction in the first round of the 2018 MLB Draft by selecting Stanford shortstop Nico Hoerner. The 5’11 196 lb. shortstop is known as an ascending player who turned it on at right time leading up to the draft. He was ranked at #52 on MLB Pipeline Top 200. So, the Cubs could be signing him as underslot pick to save some money for later. He is known for having a great approach as he hit third in the line up. He can play short or second. Here is what MLB Pipeline has to say about the Cubs’ newest player. Hoerner has a pretty good track record of performing well for an extended period of time, perhaps saving his best year for the right time in terms of the Draft. He can impact the baseball consistently, with an advanced approach at the plate, and while the numbers don’t necessarily reflect it, there is some power for him to tap into. Hoerner runs fairly well, though he isn’t overly fluid in his actions. That leads to some questions about his ability to stay at shortstop, with some seeing a return to second base in his future. College hitters who perform typically move up boards as the Draft approaches, and that’s exactly what has happened with Hoerner. He’s like a slightly less fluid version of Ian Kinsler, with the potential to be an offensive-minded second baseman at the highest level. He more than likely begins at Eugene in a couple of weeks and moves quickly to South Bend if the bat is as good as they say. However, there’s no rush to get him Chicago anytime soon. Ideally, he can be ready in 2 to 3 years. He comes across as top of the order kind of guy who can be a table setter for others. Next ›Let the Round Two of the Live Blog Begin…It will be over quick!